"My first desire is that," said Alexander, "My physicians alone must carry my coffin." After a pause, he continued, "
Secondly, I desire that when my coffin is being carried to the grave, the path leading to the graveyard be strewn with gold, silver and precious stones which I have collected in my treasury. "The king felt exhausted after saying this. He took a minute's rest and continued. "My third and last wish is that both my hands be kept dangling out of my coffin." The people who had gathered there wondered at the king's strange wishes. But no one dare bring the question to their lips. 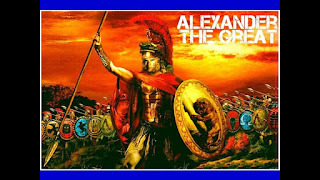 Alexander's favourite general kissed his hand and pressed them to his heart. "O king, we assure you that your wishes will all be fulfilled, but tell us why do you make such strange wishes?" "I would like the world to know of the three lessons I have just learnt. I want my physicians to carry my coffin because people should realize that no doctor can really cure anybody. They are powerless and cannot save a person from the clutches of death.So let not people take life for granted. The second wish of strewing gold, silver and other riches on the way to the graveyard is to tell people that not even a fraction of gold will come with me. I spent all my life earning riches but cannot take anything with me. Let people realize that it is a sheer waste of time to chase wealth.